Preheat the oven to 425°. Brush the inside of a 3- to 4-quart enameled cast-iron casserole with oil and line the bottom with parchment paper. In a food processor, pulse the walnuts until finely chopped. Add the cilantro, parsley, 1/3 cup of the pomegranate syrup and 1/4 cup of the barberries and puree until a paste forms. Season the filling with salt and pepper. Season the cavity of the fish with salt and pepper, then stuff it with the walnut filling. Brush the outside of the fish with oil and season with salt and pepper. Place the fish cavity side up in the casserole, curling it so it fits snugly. 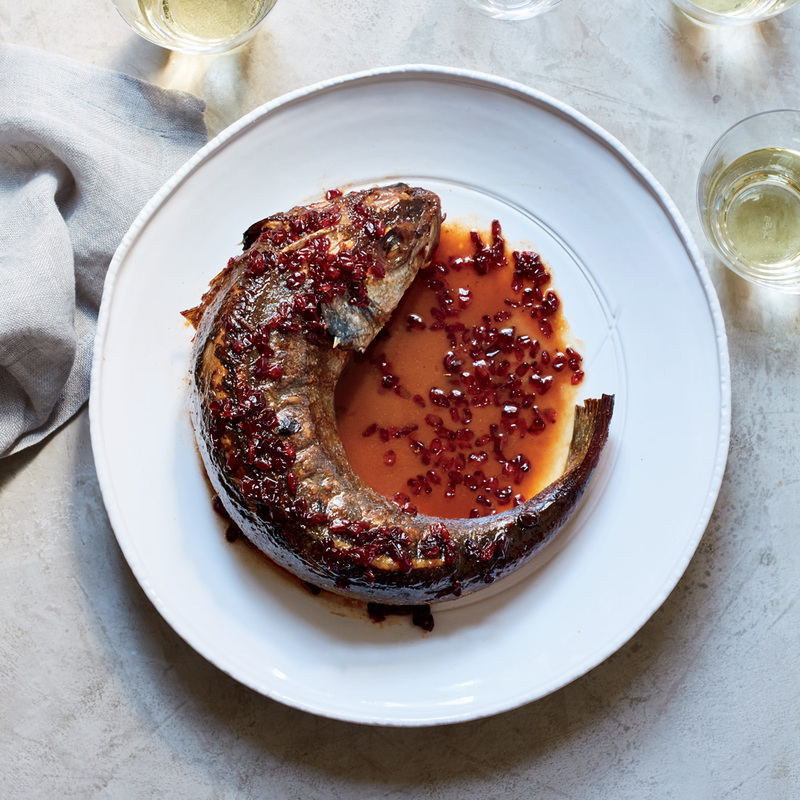 Drizzle the fish all over with the remaining 2 tablespoons of pomegranate syrup. Roast for about 20 minutes, until the fish starts to release juices. Add 1/2 cup of the sour orange juice to the casserole and roast for 25 to 30 minutes longer, basting occasionally, until it is cooked through. Let stand for 10 minutes. Meanwhile, in a nonstick medium skillet, melt the butter. Add the remaining 1/4 cup of barberries, the sugar and a generous pinch of salt and cook over moderate heat, stirring, until the barberries are softened and the sugar is dissolved, about 3 minutes. Add the remaining 1/4 cup of sour orange juice and cook, stirring, until the barberries are coated in a light sauce, 1 to 2 minutes. Using a thin metal spatula, carefully loosen the fish from the side of the casserole. Put a serving platter on top of the casserole, then invert the fish onto it. Spoon the warm barberry mixture on top, garnish with cilantro (if using) and serve. Small dried barberries are supertart and add a great fruity tang to dishes. They are available at Persian markets and from kalustyans.com.